Ginger's Garden™ Gift Certificates make the perfect gift for any occasion! Available from $10 and up. Buy a Ginger's Garden™ Gift Certificate for the perfect unique gift for any occasion! Whether purchasing for a family or friend, a co-worker or your secret pal - our Gift Certificates allow the recipient to create their own gift. Buy a gift certificate from Ginger's Garden for a birthday, anniversary, wedding, baby shower, bridal or groom party, welcome home gift, hostess or a unique baby gift. Choose from $10 and up. 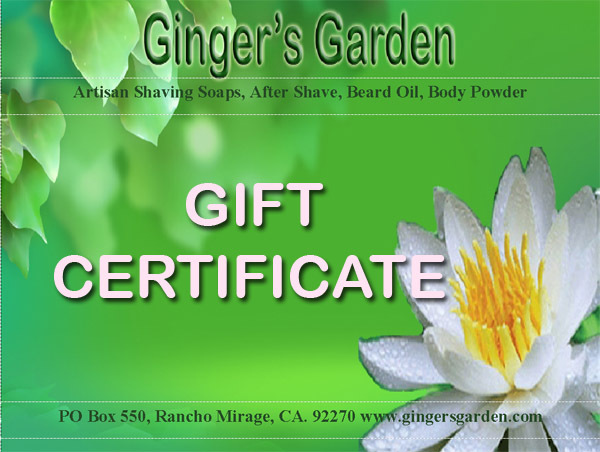 For a unique gift, purchase a Ginger's Garden Gift Certificate for your favorite wet shaver. They can buy their favorite shaving soap, shaving cream, natural aftershave, aftershave balm, wet shave mug or a Man's cologne spray. This certificate is normally emailed to the recipient after the order is paid and complete. Please indicate if you would like Ginger's Garden certificate mailed via the post office instead. If you are purchasing a Ginger's Garden™ Gift Certificate for your Secret Pal, do not use your name in the from field. Instead, simply inputting "your secret pal" instead will ensure that the Gift Certificate arrives without your pal knowing who sent it. NOTE: The shopping cart automatically calculates shipping. Your shipping will be refunded after the order is placed. Please type in the recipient's name and email in the comments section of the shopping cart when you check out.